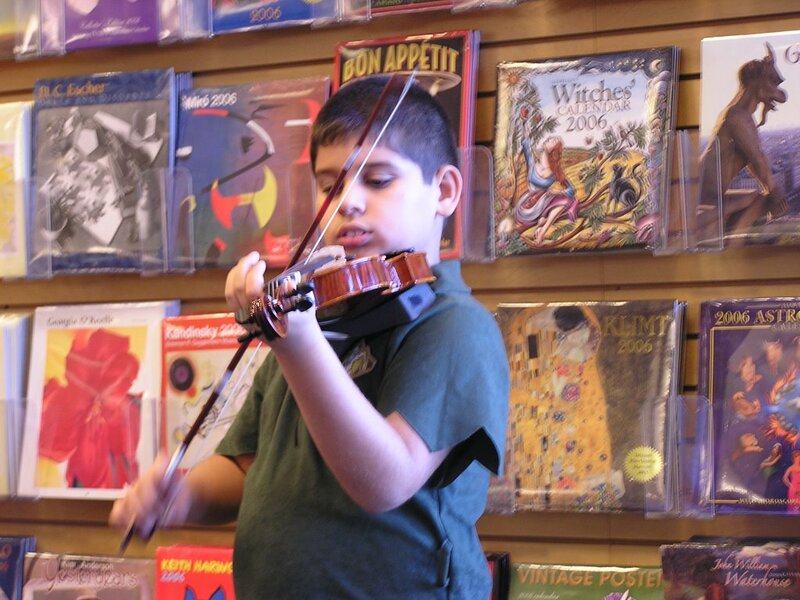 Today my oldest had his first concert. I was very proud. He has only been playing for two months! I broke two Brittany birches in three days. The first one, I haven't a clue. The second I broke shoving my foot into my beautiful peacock sock. Don't ask why I didn't try it on much sooner. But shoving my fat little calf and generous foot into a much too small sock was too much on my delicate birch double points. Thankfully I have two exta sets but the socks must be frogged. Boohoo, I got so far! 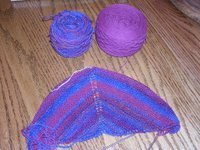 To make up for it my Andean Silk from Knit Picks came and I started the cardi on page 66 of the new Sally Melville book on color, Color Experience. I can be a little obsessive. 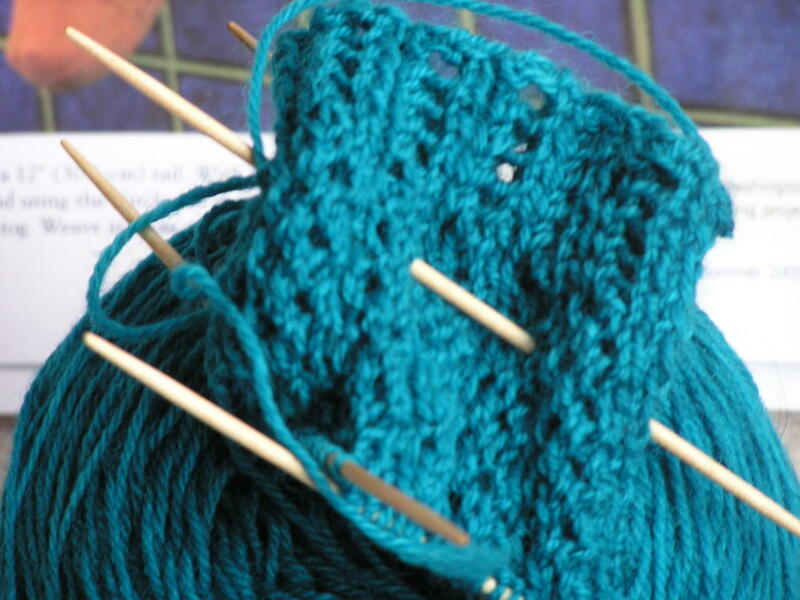 This week it was brought to my attention that as a guild we were challenged to knit a hat for the next guild meeting. 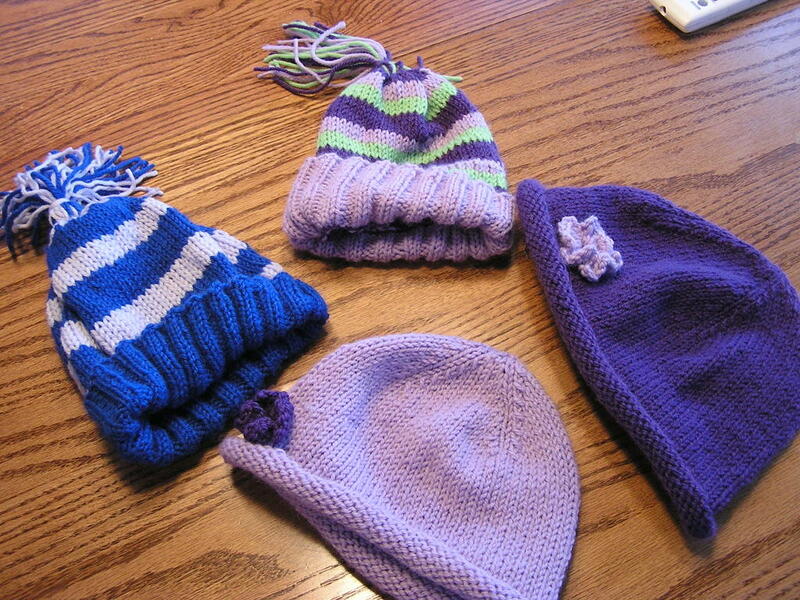 We are knitting hats for the Y's woman's shelter. Well of course it was only 'bout 5 days to the guild meeting. 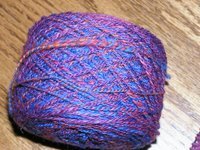 I love an excuse to go buy more yarn-I didn't have any washable yarn! So I knit like a fiend and basically put out a hat a day. The last was the blue striped. My daughter loved the lavender striped so I had to do it in her colors, blue. The obligation shawl #2 is so close to being finished. I have a month and a week to finish #2 and #3. 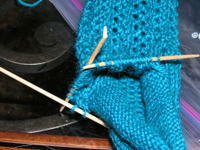 I should be able to do it easily although I can't say I am going to feel like knitting this pattern again anytime soon. 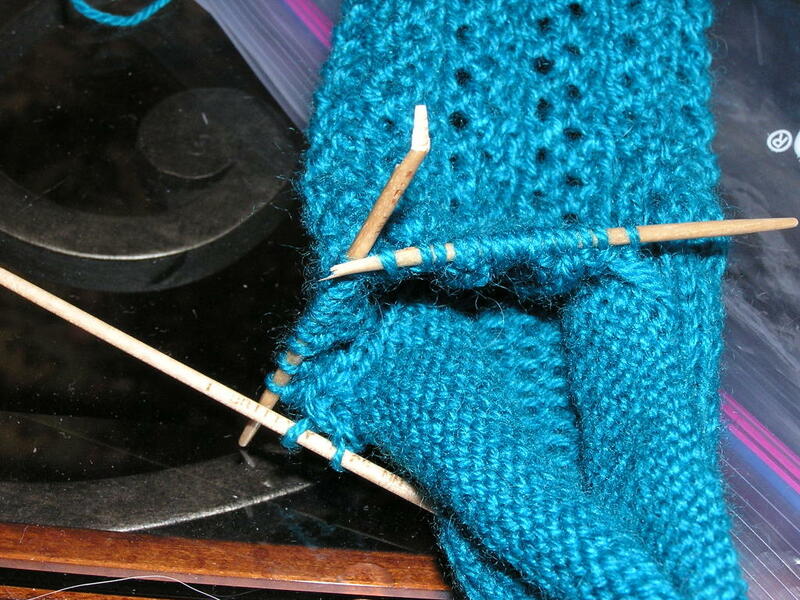 The socks are going slow with all of this obligation knitting but I am savoring the colors of the yarn. Luscious! Wow! Such genious! Right now as you can tell Evelyn Clark is my favorite because her designs make you looks like a genious without too much sweat or thought! The sock on the left is Lisa Souza's peacock sock! soon to be go with the flow socks by Evelyn Clark, IK summer 2005 and the socks on the right are Lisa Souza's sock! in garnet soon to be merino lace socks by Anne Woodbury, Ik summer 2003. 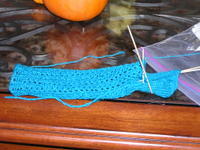 I'm getting my lace fix through socks because I just don't have the time to devote to a real piece of lace. Next year all three kids will be in school all day long. I will actually be able to get the house clean and have a few minutes to rub together for other things! 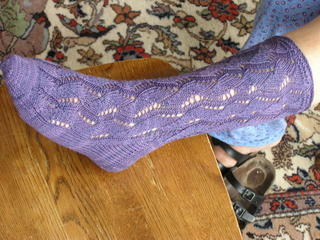 Woo Hoo , my waving lace socks are done! 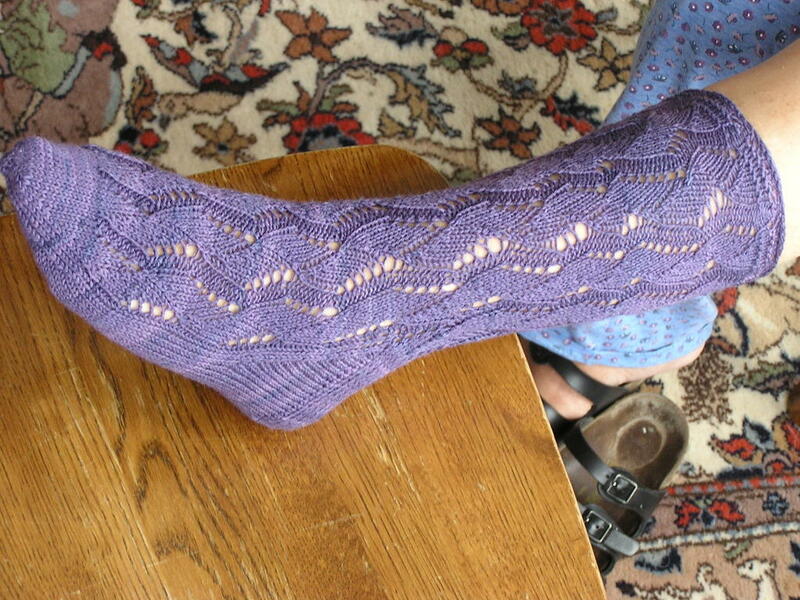 Waving Lace out of Lorna's laces Shepard Sock in blueberry on size one needles. 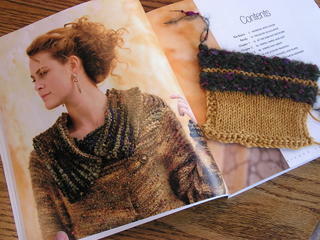 The pattern is from Interweave Knits Spring 2004 by Eveyln Clark-one of my most favorite designers! Everything she does looks complicated but in fact is easy and makes you look like a genious! 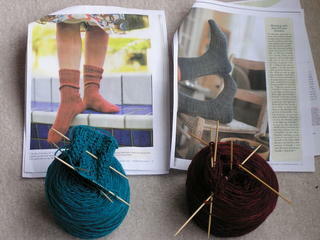 Now I'm going to make socks with my Lisa Souza sock! 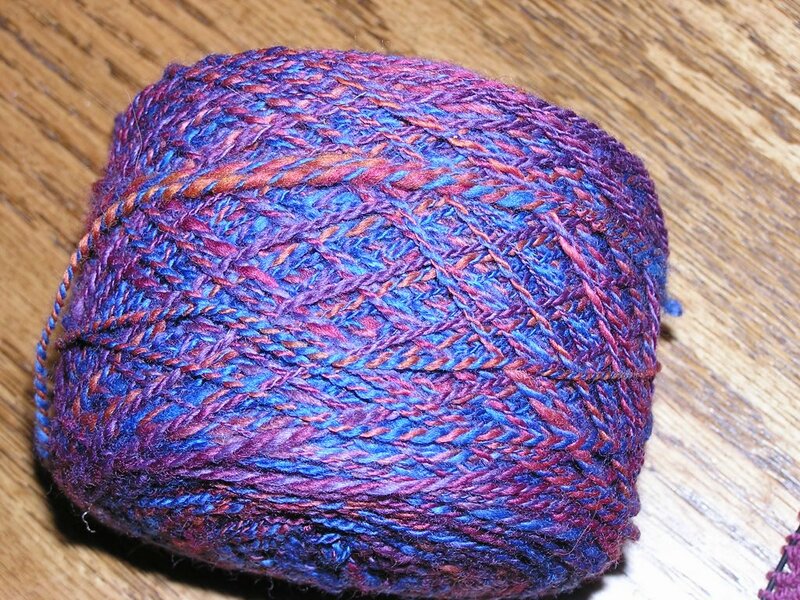 yarn for me-me I tell you! 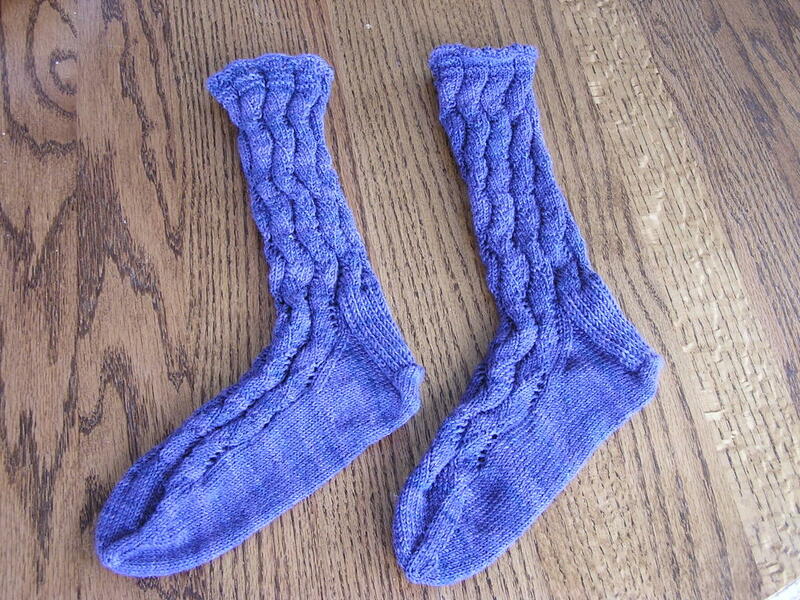 I only have two pairs of handknit socks and one is 12 years old! Everyone likes handknit socks. I'm doing Lisa's peacock color first. I asked her to send me a surprise color and that is what she sent and I love it! I sure hope the Nancy Bush Vintage Socks book comes in the mail today(like I'd actually have time this weekend to start it anyways!). I can't wait to try out some of the patterns in there! When I get a chance to start I'll post. 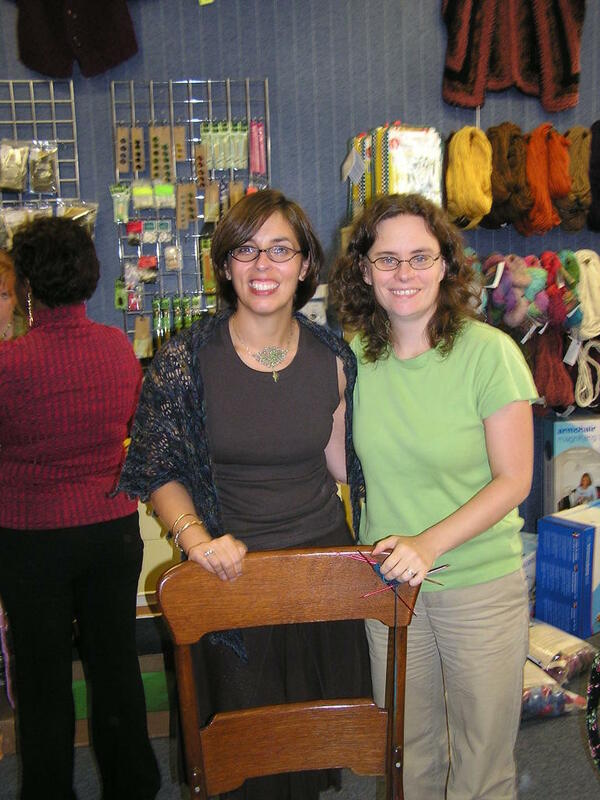 Sunday Stephanie Pearl-McPhee was at my lys, Sit 'N Knit, signing books. She was witty and fun. 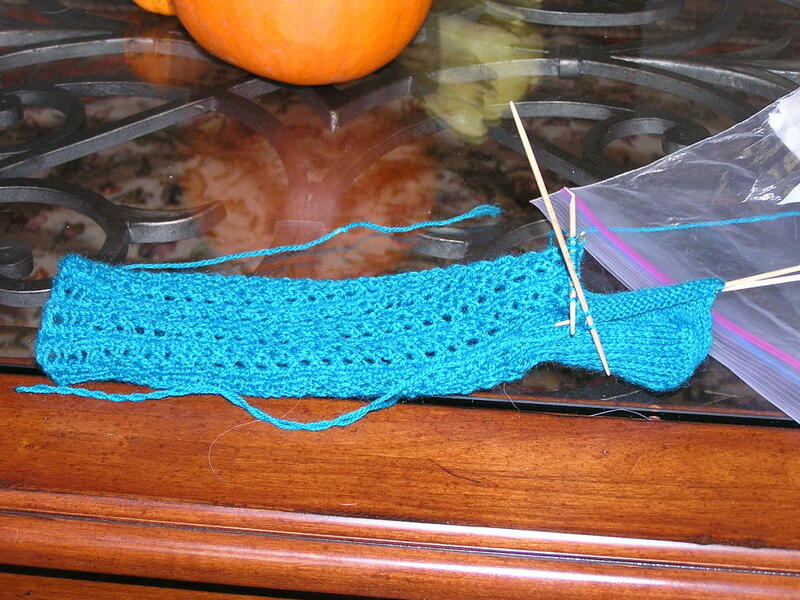 It was so nice to sit and knit with her. After the book signing she read one of the essays from her book. We were all laughing hysterically. Later there was less traffic so Stephanie, Betty, Kristine(of Strung Out blog) and I sat and talked and knit. Later Elizabeth (of Pick Up Sticks)joined us. What a great day! It was especially nice to meet Stephanie since she and I are on the same Yahoo List together,Fibertradtions. Some of the nicest, most knowledgeable ladies are on that list and I am always honored to meet one. I was pretty washed out after a few hours and had worn out my babysitter's generosity so I had to leave. It was a wonderful fibery day though!